Children today have grown up surrounded by technology their entire lives. 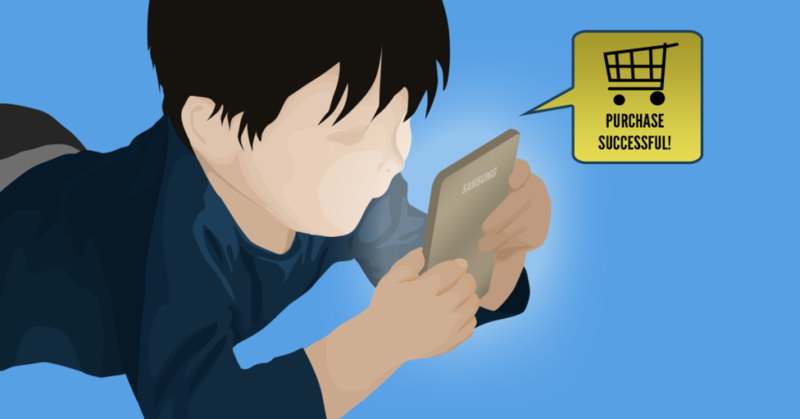 Since before they are old enough to read they can pick up a tablet or smartphone and swipe at apps and games with ease. Modern kids have an intuitive understanding and ability with technology that older generations can barely imagine. This abundance of technology, however, comes with a price. Easy access to any marketplace can be a double-edged sword. The convenience and ease of use is a boost to those of us needing a quick app, but accidental purchases can cause a lot of headaches. One-click online shopping was once one of the biggest dangers our bank account faced. Now, many of us carry multiple devices, each with their own marketplace and app stores. With modern tech, mobile applications, whether on iOS or Android devices, are easier than ever to buy and download. So simple in fact, that a child could do it. Designed to Appeal – Children love to download mobile applications that feature their favorite characters, cartoons and TV shows. Advertisements are aimed specifically for children in ways that will invite them to click a link and instantly download a game. Developers commonly use, what is known in the business as, a ‘Freemium’ model. This means that the game is free to download and start, but inserts paid ‘upgrades’ designed to make the player part with cash. Freemium Games – Upgrades to games may unlock more levels, purchase an in-game currency, or outfit a character with special attributes. Competitive online games commonly employ a strategy that gives paying players an unfair advantage over ones who don’t pay. This is often referred to as ‘pay-to-win’ and entices players to spend more to get on the same level. There are regular stories in the news featuring kids spending thousands on in-app purchases for virtual characters. In some cases, children can use real-world money to buy items thinking they are spending in-game currency. Apps to Help – Of course, it’s unfair to give all applications a lousy name. Many deserve it, but not all apps are guilty of behaving badly. There are fitness apps, productivity apps, and educational apps that can act as useful tools to help enhance your day. Children can get a lot from high-quality applications in the same way educational software for the computer can be a huge classroom boost. Secure Your Device – The best step you can take to prevent running up enormous app bills is to disable in-app purchases on your devices. This prevents apps from being able to take funds for digital items. The process to do this is simple, takes less than 2 minutes, and can save you huge amounts. Safe Apps – With these options enabled, whether using an iOS or Android device, your phone or tablet is safe from app purchases in any hands.